The ruthless Dr. Sloth is back to his old evil habits in this game! Our favourite Grundo spy, Gorix and his Cybunny friend, Cylara are fleeing from Dr. Sloth's evil base, and they need your help! Dr. Sloth has noticed their escape, and is sending his entire fleet after the duo. Do you have what it takes to help them escape his treacherous grip and make it safely to Kreludor? In this game, you control Gorix and Cylara's escape pod. To move it, just click on the adjacent square you wish to move the pod to (this can be in any direction, including diagonals). 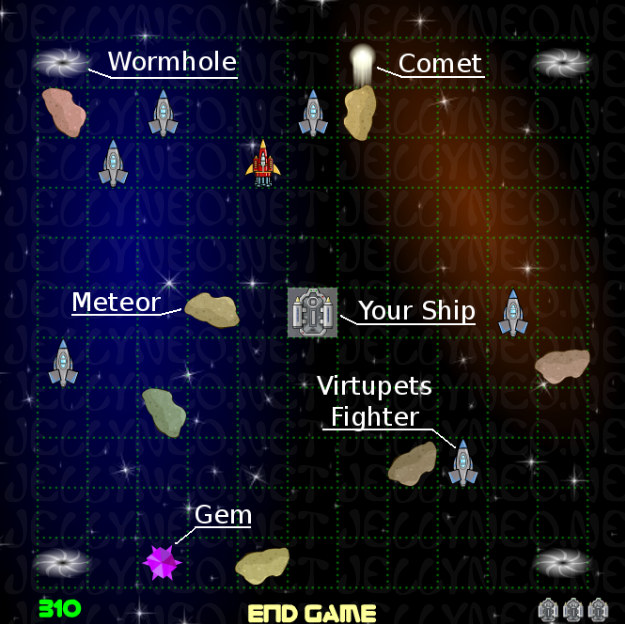 After your move, all the attacking vessels and the comet, if there is one for the level, will move one space toward you. The only exception to this is when you activated the green cloak gem, in which case the ships and comet will move randomly. If you feel the need, you are able to shoot at the ships through your side guns using the space button or by clicking on your escape pod. Shooting counts as one move. Comets, however, are indestructible. You are given three lives to begin with, and you lose a life each time a ship or comet overtakes you. To pass each level, you must destroy all the ships on the grid, whether it be by comet, collision, or shooting. You will receive 10 points for each blue ship and 15 points for each red ship that you destroy. The best strategy to win each level is to always be on the lookout for ships that you can easily force to run into each other or meteors. Of course, while scouting for this, you'll want to ensure that doing this doesn't put you within another ship's range. Here are the various objects you will encounter over the course of playing the game. Your ship will always show up in the center of the screen at the beginning of the level. Comets will always move in your direction, and are indestructible, so don't attempt to destroy them. Meteors are stationary. You are unable to steer your ship into them, but with clever maneuvering, you can crash grey fighters into them. Grey fighters will follow your ship wherever you go, so they are easily led into crashing into meteors, comets, or each other. Red fighters are smarter about how they move. They avoid all objects on the grid and can only be destroyed by being shot or hit by a red gem. Rubbish is made when a ship is destroyed by something other than a meteor. It destroys any ships that run into it. Wormholes are found at all four corners of the grid. They will teleport your ship to any random space in the game, except another wormhole. If you are cloaked and a grey ship happens to land on that space, it will be destroyed. Downgrades all enemies, including comets. The red fighters become grey ones, the grey fighters remain the same (can't be downgraded), and the comets turn into meteors. Cloaks you. All moving objects on the screen move in a random direction for the remainder of the level. Adds an extra 50 points to your final score. Destroys all ships within a 2 square radius. Comets and meteors are unaffected. Type empulse while playing to get a slightly reduced red gem effect. This code can be used once per game. All ships within a 1 square radius will be destroyed. Comets and meteors will be unaffected, just as when using the gem. You should only use this if your ship won't be destroyed by a comet in the next few moves without question. Remember, the best strategy is to force ships to run into each other or meteors. It's really easy to beat each level this way. Just keep in mind that red ships are smarter than that, and will avoid these collisions. They still need to be shot to be destroyed. It's also a good idea to shoot ships that are within your range if the next move will cause more ships to run into the rubbish left behind. Again, red ships will not be fooled by this, unfortunately. If you can help it, it's best to avoid having a rubbish heap occur on top of a gem. If this happens, you can no longer access the gem. Remember that wormholes are your friend! They may teleport you within the range of ships, but overall they give you a great advantage.